Veterans Day is an opportunity to honor and give thanks to those who have served or are serving in the military. It is sandwiched between the excitement of Halloween and Thanksgiving and this day can sometimes go unnoticed. Riverview is hosting a Penny Wars fund raiser through the month on November until Thanksgiving Break. Each class earns points by collecting pennies. Points are subtracted from a class when students “bomb” a class with silver coins or bills. The grade level with the most points at the end of the war wins a reward. All the money raised will be put into a scholarship fund for a former Riverview student who will be graduating from Spanish Fork High School this year. Current Riverview students are paying it forward and helping a Riverview graduate ‘Make a Mark’ in the world! 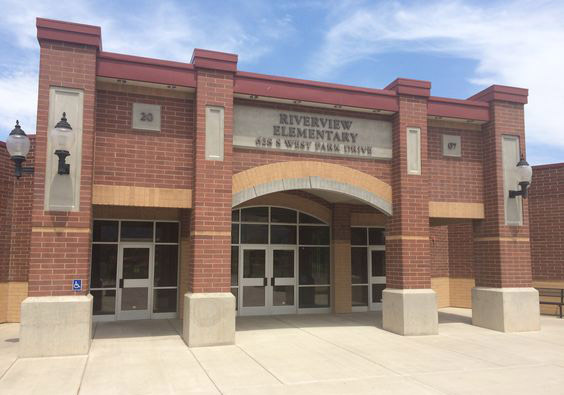 As of right now, Riverview has collected $980 to help fund scholarships for graduating Spanish Fork High School Seniors. Way to go Riverview! Riverview Afterschool program and Riverview Student Council are pleased to announce the eighth annual Food Drive service project. This service project will run until Wednesday, Dec. 20th, our goal is to BEAT last year’s total of 3,000 cans of food! The food will be donated to families in our school, Nebo Pantry, and the Utah Food Coalition. The Nebo Pantry is for homeless and transient students in our district. The District currently has over 1,700 students in this situation. This is a great opportunity to teach our students about service and being grateful for the things we have. All cans should be brought to your student’s classroom to be counted and recorded. PLEASE make sure the cans have not EXPIRED. THANK YOU FOR YOUR SUPPORT!! LET’S ALL WORK TOGETHER FOR A GREAT CAUSE!! December 19th – Second Grade Christmas Program 2:15 – 3:00 p.m.
December 21st – Make Your Mark/Christmas Sing-Along Assembly @ 9:00 a.m.; School dismissed at noon.